i’m learning so much from this projects but i want improve my skills and delete my errors. So, please, give me every tips and feedback about this projects! You need to think about how to best implement your design on a mobile device, because below is what you see on an IPhone. 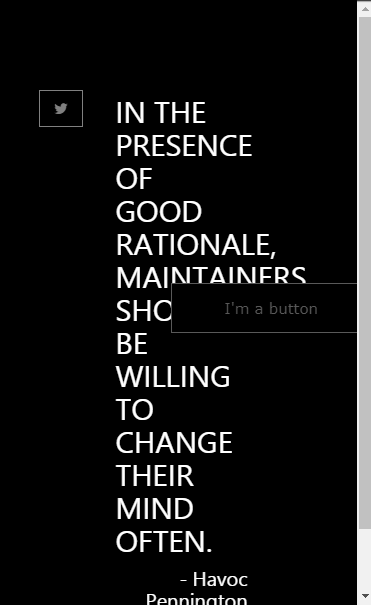 Your button is using position:absolute, so it overlays the quote text. Need to think about specifying a font-size for your quote text using em as the unit. When the page first loads, you have no quote showing, but you have a tweet button showing. I suggest setting the display property to none ( display: none; ) and then using JQuery to show the button when it is clicked. Tank you for the suggestions. I never study about design on a mobile device, but i think it’s the time to do this. I will start soon. I did something. Can you give me some tips and feedback about my upload?